It polls pretty well, even in an unscientific legislative survey. 2/3rds of voters are all over it. Just 1 out of 5 voters are against it. 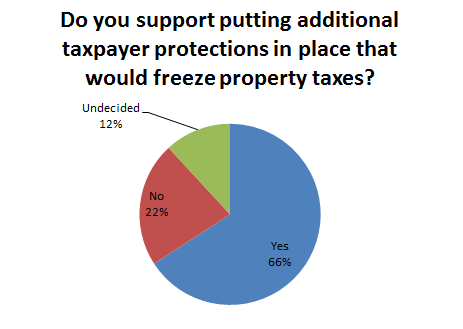 The final survey question read “As property taxes continue to increase even while property values decrease or remain stagnant, do you support putting additional taxpayer protections in place that would freeze property taxes even if those freezes would create a hardship for schools and other service providers?” According to the results, 65.82% of the respondents said “yes” to the need for additional property tax protections, while 22.32% answered “no” and 11.86% answered that they were not sure.